Fungi, which includes molds, mildews, and yeasts, can produce contagious diseases such as ringworm and a host of other conditions. Tinea is the technical term for ringworm. It is characterized by itching, scales, and sometimes painful, circular lesions. 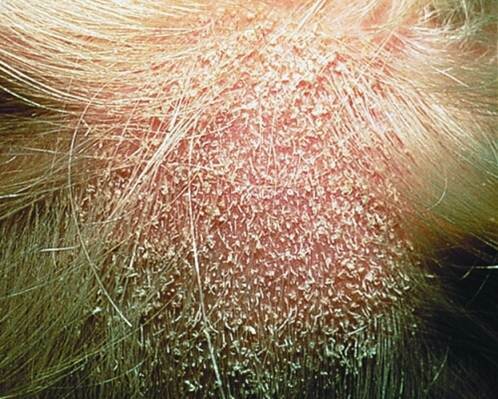 Tinea capitis, or ringworm of the scalp, is characterized by red papules or spots at the opening of hair follicles. Tinea favosa is characterized by dry, sulfur-yellow, cup-like crust on the scalp called scutula. Tinea pedis is the medical term for fungal infections of the feet. They occur on the bottom of the feet and often appear as a red, itchy rash between the toes(most often between the fourth and fifth toe). All forms of tinea are contagious! They can easily be spread from one person to another. Infected skin scales or hairs that contain the fungi are known to spread the disease. Practicing approved sanitation and disinfection procedures will help prevent the spread of disease. Your job is to recognize, not diagnose any medical condition. Refer them to a physician for treatment.